I cannot imagine, big fans will want more and light fans will not care. What was most disappointing about Charlaine Harris’s story? It was pretty much one-line "endings" to each characters story. I was expecting more of an epilogue. Would you listen to another book narrated by Johanna Parker? It sounded as though the narrator was even bored of the one-liners. This book is best used as a companion book that you can open up in a physical form and scroll through the characters to find the one you want. It has been a while since I read the books in this series so the names of all but the main characters mean little to me without going back to the books, which I don't really care enough to do. Maybe I'm too cynical but I wonder whether the publishers are simply milking the series after it should have been dead and buried (pardon the pun) a while ago - I found the last 2 books very disappointing; they lacked the plot complexity and multiple threads of the earlier books. This was not a good audiobook - it was like having an encyclopedia read out loud. Hard to follow or remember the information, though the information was interesting. I also guess I didn't look carefully at the length of the audiobook before I purchased it - I thought it would have 2 hours or so...it was only 47 minutes. What disappointed you about After Dead? Has After Dead turned you off from other books in this genre? NO! But I am very disappointed in Charlaine Harris. The idea was good but needs a few more details...A LOT MORE DETAILS!!! What aspect of Johanna Parker’s performance would you have changed? Not a thing; wish she had more material to work with. If you could play editor, what scene or scenes would you have cut from After Dead? This should be an audible free listen! Knowing the out come of the characters in the Sookie Stackhouse books provides some closer, for the most part. The problem I have with the telling of each person's ending, after the last Sookie novel, is that there are so many. One may not remember the characters. What I would change is this that Charlaine Harris, would write a reminder of who the character was. Perhaps reference the book the character was in, or what they did. Such as, "Jason, Sookie's Brother, and weir panther", or "Quinn, the weir tiger, an once Sookie's lover." What could Charlaine Harris have done to make this a more enjoyable book for you? She could have given a book reference to where the characters came from. A better reminder of who the character was. Unless you are a super Sookie Stackhouse fan freak, it will be difficult to remember who's who. There were no scenes. However, the best ending for me was Sookies. Her wedding gift from Eric was nice too. Could you see After Dead being made into a movie or a TV series? Who should the stars be? I cannot see this as a movie, since this is more of a reference book. If you have read all of the Sookie Stackhouse books, you will enjoy this short story that brings closure to all of your favorite characters. If you have not read all of the Sookie Stackhouse books, this will not make any sense. Would you try another book from Charlaine Harris and/or Johanna Parker? Probably not but that's mainly because I've already listened to most of the Sookie Stackhouse series. 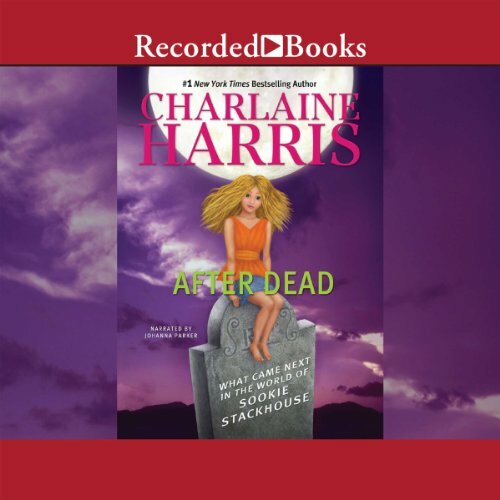 If you’ve listened to books by Charlaine Harris before, how does this one compare? This book was written like an encyclopedia (ie each character being a topic) rather than a set of short stories. It was interesting to hear was happened next to the characters - the brief approach was suitable for some (ie Jane Boathouse) but didn't necessarily do justice to others (ie Eric). Johanna Parker is by far my preferred narrator for the Sookie Stackhouse stories - it just doesn't sound quiet right listening to some of the other narrators given that Johanna's narrated all of the novels. It wasn't the story at all. This book is only one or two lines devoted to every character from the entire series that didn't have an ending in the final book. It is needed to complete the series but for $6 just the paperback book would have been better. I think it would be better read than listened to as a book. I had to listen to it a couple of times because I missed some of the folks. It was only one or two sentences per character and sometimes I couldn't place the character before we were on the next one. It is needed for the series completion but since it is so short and the structure of the book I think it would be better to read it. However, the kindle version costs more than the audible book here.